Carter Hall finally returns to the DC Universe in an all new series by the superstar creative team of Robert Venditti and Bryan Hitch. But although I like the work of both guys, I bought Hawkman #1 expecting the worse. Again, not the fault of Venditti and Hitch. If anything, it’s the fault of DC Comic who have done their best over the last two decades plus to destroy Hawkman. The character has become one mess after the other, and I’m not so fond of the whole reincarnation angle that’s become the end all of every version of Hawkman. However, I am very pleased to say that the first issue of the new Hawkman title, is phenomenal. Actually, Hawkman #1 is easily one of the best first issues I’ve read in a long, long time. A huge amount of credit must go to Robert Venditti, who brought Carter Hall back to basics. In this issue we see Hall as an archeologist, something I haven’t seen since the 1991 Justice Society of America mini-series. Within a few pages we learn everything we need to know about Carter Hall. How he makes a living, that he’s happy doing what he does, and that even he has time for friends. Even if you haven’t read a single Hawkman story since the 1980’s, Hawkman #1 is easy to follow, and a great jump on point for all readers. This comic pays homage to everything that has gone before, but it also manages to stand alone. A truly great job all around by Robert Venditti. In the art department, Bryan Hitch brings the fun adventure to live with stunning visuals. Hitch has ada[ted his style for Hawkman, and I for one love his stuff in this issue. Carter Hall looks like a real person, not a bodybuilder playing archeologist. Even the backgrounds look great, a fishing boat looks like a normal fishing boat, and a friend’s apartment looks like a place where a single person would live. But all of the art in Hawkman #1 is lavishly detailed, and worth every penny I paid for this comic. Hawkman #1 is everything I could have asked for in a Hawkman comic. In a single issue I got mystery, adventure, exploration, and a fight that only Hawkman could have. Venditti and Hitch packed so much stuff into this comic, it’s shocking that it is not a double-size issue. This is how you launch a superhero comic, this is the type of book that will keep me coming back month after month. Out of all the Dark Knights Metal tie-in issues, I was most excited for Hawkman Found #1. I even preordered the issue, Why was I so damn excited? because Hawkman has been one of my favorite characters since I saw him on the cover of All Star Squadron #1 many years ago. Unfortunately, Hawkman Found #1 was a huge let down for me. Hawkman Found #1 dives deep into the world of Carter Hall/Khufu/Katar Hol and how they exist in between lives. Basically, if you don’t know the convoluted history of the character, you probably won’t know what’s going on. And even if you’re familiar with the backstory, in this issue we don’t know why Carter Hall is in this realm, how he got there, or why he’s trying to go to or why. 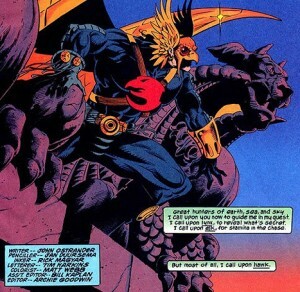 Through the course of Hawkman Found, we do see images of Hawkman’s past lives, including Khufu and the Silent Knight. We also see Hawkman trying to remember what his purpose is, and then it’s over. That’s it, thanks for coming. This was the first Dark Knights Metal issue that left me disappointed. I truly was expecting more from this comic. Hawkman has been one of my favorite comic book characters since the day I saw him on the cover of All Star Squadron #1. That comic was released in 1981, but I didn’t discover it until about a decade later. But I knew right away that I had to dig up more Hawkman comics to learn more about him, but it wasn’t easy. After his own series was cancelled in the 1960’s, Hawkman appeared in the pages World’s Finest and Detective Comics, and as a member of the Justice League of America. But a Hawkman solo book was nowhere to be found. 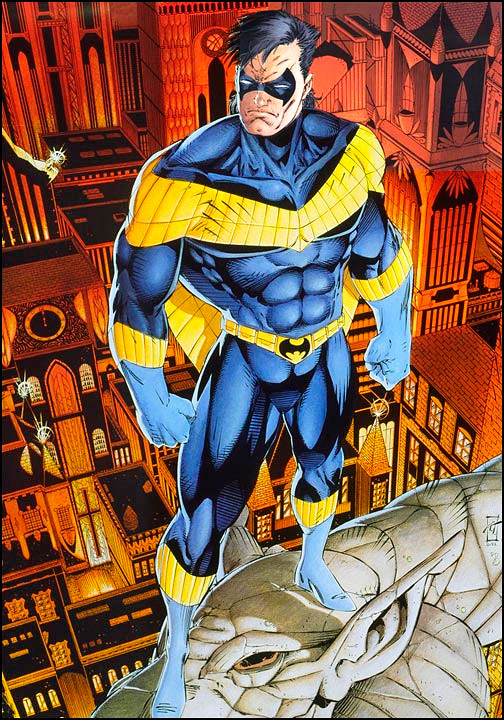 When I started making regular visits to New England Comics in 1990, the only Hawkman book being published was Hawkworld, but this didn’t look like the same Hawkman I’d met in All Star Squadron. Luckily for me, a used book store in Plymouth MA had what I needed. At that hole in the wall of a bookstore, I found a 1985, four issue mini-series called The Shadow War of Hawkman. The series was written by Tony Isabella with art by Richard Howell. I picked up all four issues for $1 a piece and headed back to my family. Shadow War was my first Tony Isabella book, but the writer made an immediate impact. This mini series introduced me to Katar Hol and Shayera Thal, the invading Thanagarians, and more. And I knew Isabella meant business when Hawkman finds a Hawkwoman-shaped silhouette burned into the wall. What I ended up finding was a Hawkman special from 1986 also by Tony Isabella and Richard Howell. But there was more goodness to be found at the bookstore: the entire run of the Hawkman series also by Isabella and Howell! Sadly, Tony Isabella only stayed on the book until about issue 7 or so. If I recall correctly, I think there were some creative differences with the editor. The rest of the run was okay, but it wasn’t anywhere near the stuff Isabella was doing. I wouldn’t be surprised if the change in writer was one of the reasons the book was cancelled with issue 17. You rarely hear about Tony Isabella’s Hawkman run, and I have no idea why because this was a great book. It was clear that Isabella had a long-term plan for the book, and it’s a shame that we never got to see what he had in store. The bottom line is this: if you’re a Hawkman fan like me, keep and eye out for the entire Tony Isabella run, it is one of the best Hawkman sagas you’ll ever read. 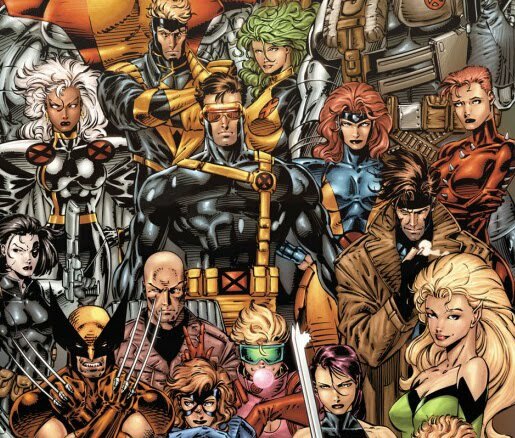 During the late eighties and early nighties, comics were dominated by the likes of Todd McFarlane, Rob Liefeld, and Jim Lee. First with their work at Marvel Comics, and later with their little company called Image Comics. I was a bug fan of all three, and in fact it was their art which inspired me to pick up a pencil and a sketchbook, and eventually get my degree in graphic design. Jan Duursema has been in the comic book business for over three decades. She’s worked for just about every company out there. But my favorite work by her is her short run on Hawkman. To me she is one of the best Hawkman artists ever. Nobody has matched her Hawkman since, and maybe nobody will. Sadly, her run on the book was fairly short (six or seven issues I believe), so she’s never mentioned among the Hawkman greats. All I know is that Jan Duursema is responsible for me picking up a Hawkman book, and for that she has my eternal gratitude. If you own a good size stack of comics, chances are at least a few are inked by Art Thibert. Guy has inked everything in comics, and is without a doubt one of the best inkers the industry has ever seen. However, Art Thibert is one hell of an artitst too. 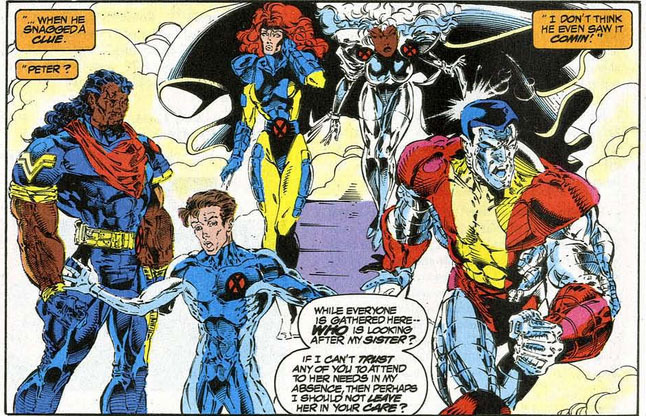 Nearly twenty-three years later, I still can’t believe Marvel didn’t have Thibert take over X-Men full-time. His art was (and still is) gorgeous. 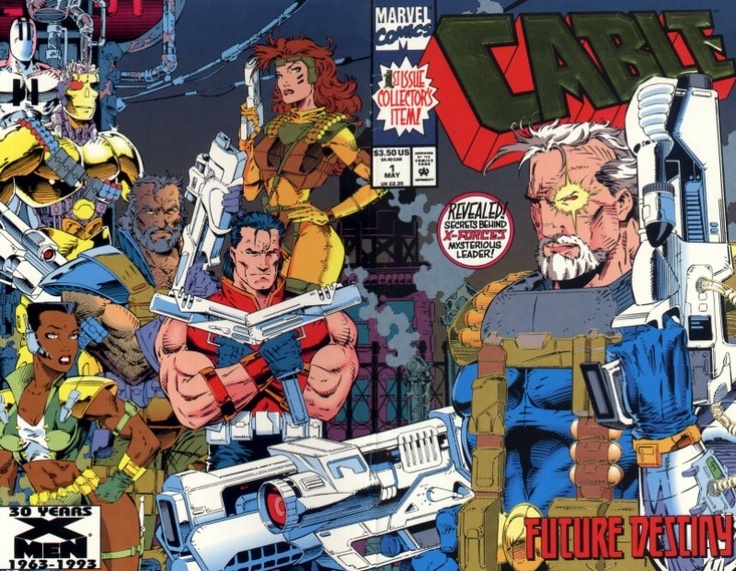 Thibert drew a couple of issues of Cable for Marvel. He later wrote and drew his own creator book for Image called Black and White. A really fun book all his fans should read. The first time I saw Ryan Benjamin’s artwork was in Union #0 from Wildstorm/Image. Although I wasn’t a fan of Union, I started picking up the book solely for the art. 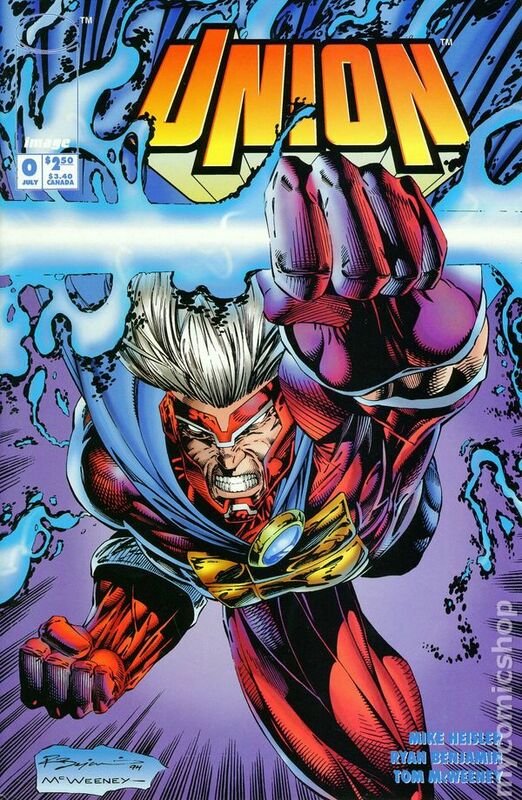 I was quickly becoming a fan of Benjamin’s work, and I followed him to the Grifter book, and beyond. Pick up copies of UnCanny X-Men #303 and X-Men #27, and tell me Richard Bennett wasn’t a superstar in the making. His style was completely different from anything else out at the time. But Marvel being Marvel, didn’t put him on a book full-time, and eventually lost him to Wildstorm where Bennett wrote and drew Brass. Nowadays Richard Bennett is out of comics because he’s too busy drawing storyboards for movies. Oh well, comics’ loss is Hollywood’s gain I suppose.